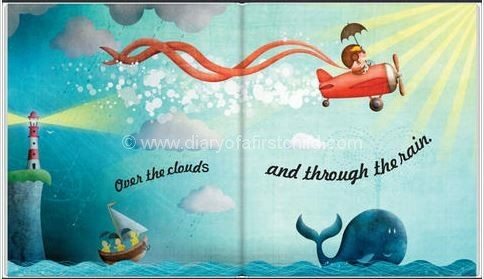 This week we read Away In My Airplane a sweet little book about a boy who takes his airplane out for a spin through the rain, through the sunshine up and down. It’s a journey of imagination and the repetition of the phrases and concepts of ‘through the rain’ and ‘through the sun’ make the book almost rhyme like. 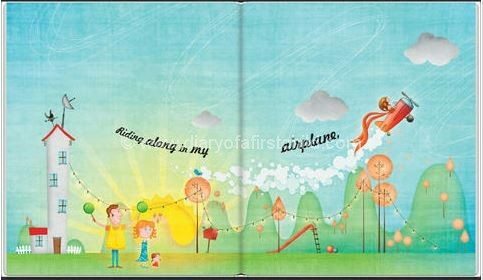 Written by Margaret Wise Brown, and illustrated by Sir Fisher Henry, the illustrations in Away in My Airplane are beautiful, bold, deep and striking. I love full page, bright colours in children’s books, and I think – for me – this book does it just right. As I said, there’s a lot of repetition, which makes it nice for children. Nursery rhyme like. It’s nice. Each page has sun and rain/night and day/light and dark. 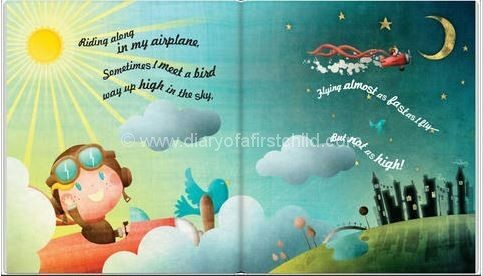 It’s the perfect book for kids preparing for a long haul flight, specially as you can draw parallels to the upside down time zones, and flying through the clouds, above the clouds, shortened or lengthened days. 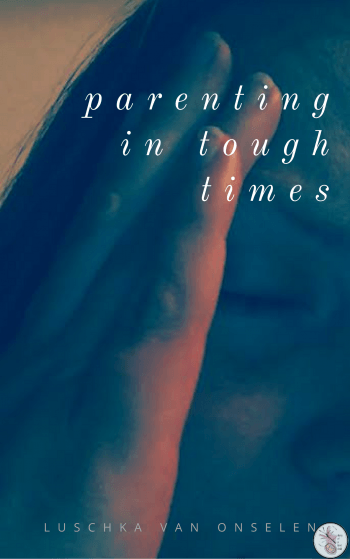 The only negative from this book, in my opinion, is the font – it makes it quite hard to read upside down, which I often end up doing with two children who both want to sit in front of the book! Away In My Airplane is available at Amazon UK, Amazon US and The Book Depository, which offers world wide free delivery. I like doing a craft activity with the children when we’ve read a new book – it gives us time to discuss the themes in the book, and it gives us time to mull over a story, rather than just move on to the next thing. 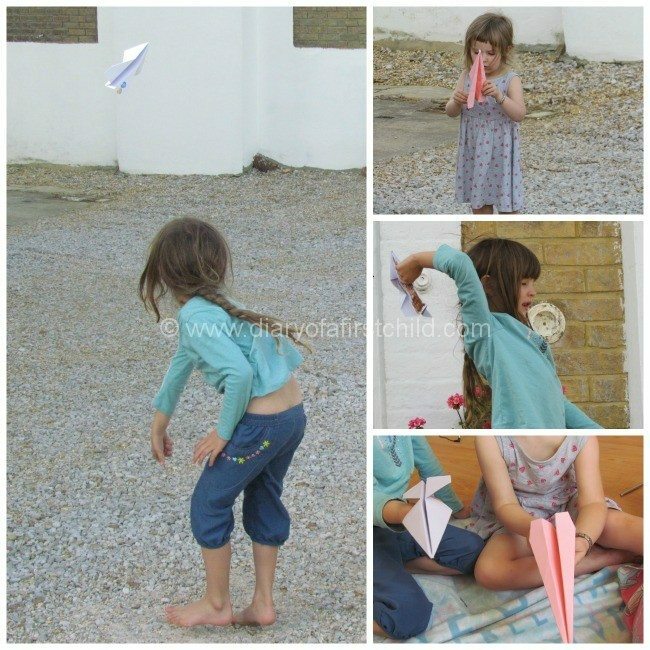 For this activity I Googled a template for how to fold a paper plane, which the girls then took time decorating with stickers and paints before we took them outside to see how far and high they could fly. 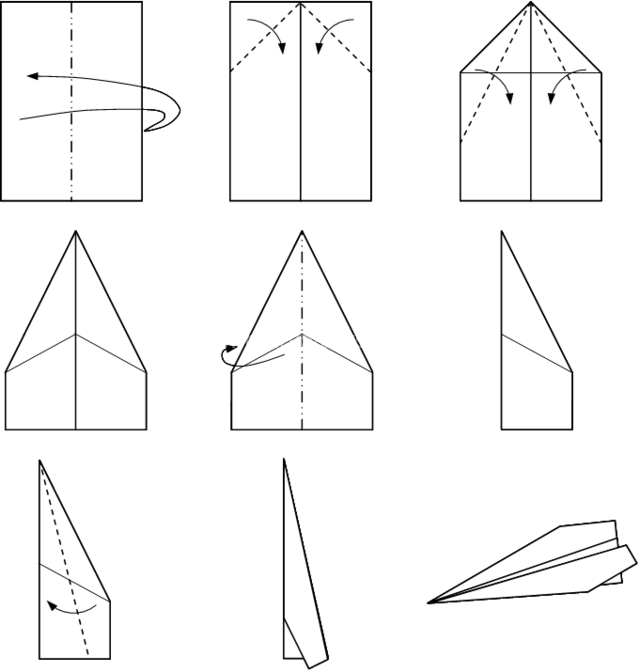 Between you and me this was an interesting lesson in following instructions too: I had two pieces of paper, and followed the same instructions, and yet the planes came out different! Neither flew particularly well either, between you and me, but the kids didn’t seem to notice. They laughed and played and had fun. It was great, really. *We received this book as part of the Paragon Book Buddies programme. Thoughts and opinions are my own.